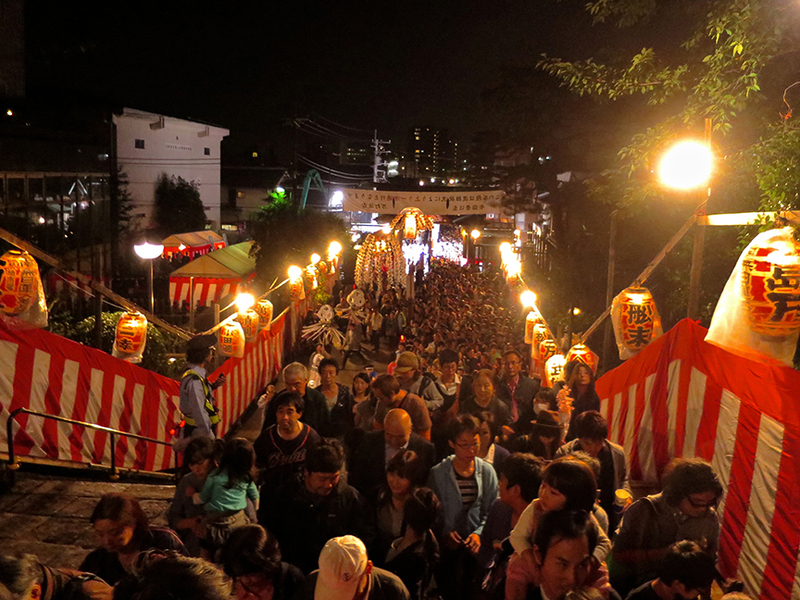 Every once in a while, Japan so wildly exceeds expectations, it’s hard to put it into words, so I’ll just show you pictures of last night’s Oeshiki Ikegami festival instead. 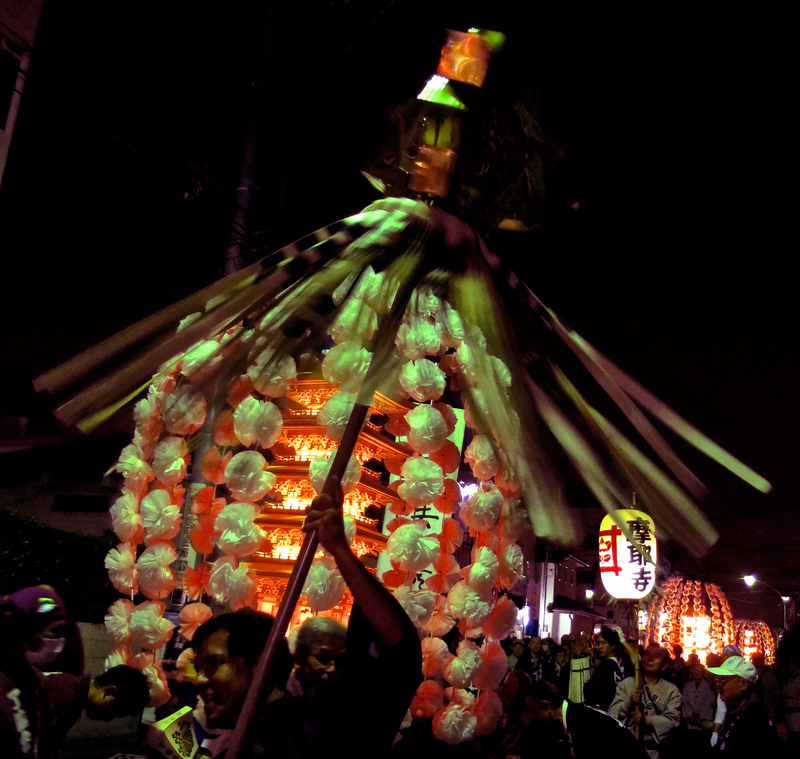 Strong men twirling pikes announcing the names of their temples danced through the streets ahead of their lanterns. Every lantern was different. This one was fantastically decorated in gold. 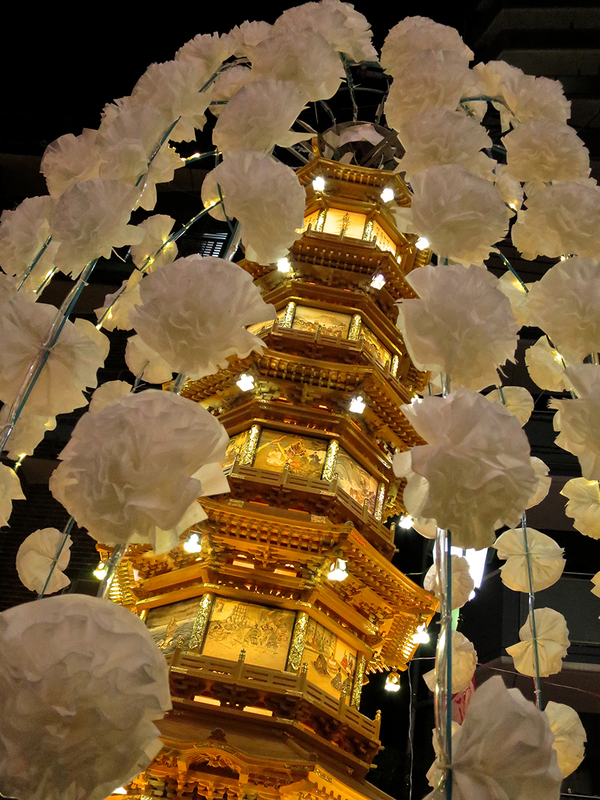 Intricately constructed wooden models of each participating temple glowed with inner light, festooned with garlands of paper flowers. Some were dramatically lit so they alternated light and dark. Look at the colored lanterns on the eaves of this one! 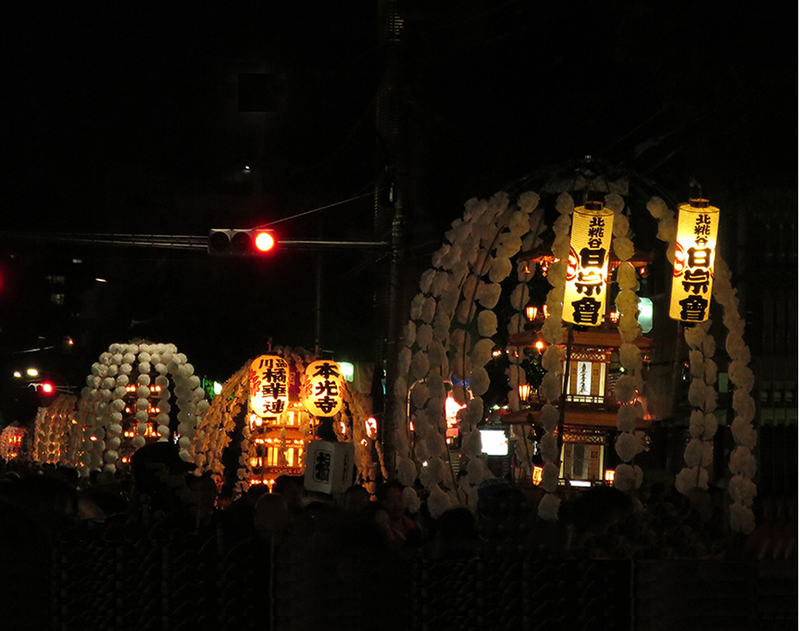 The hits just kept on coming, as the lanterns were paraded through the streets of Ikegami, wending their way to the temple where famed Buddhist monk Nichiren breathed his last. 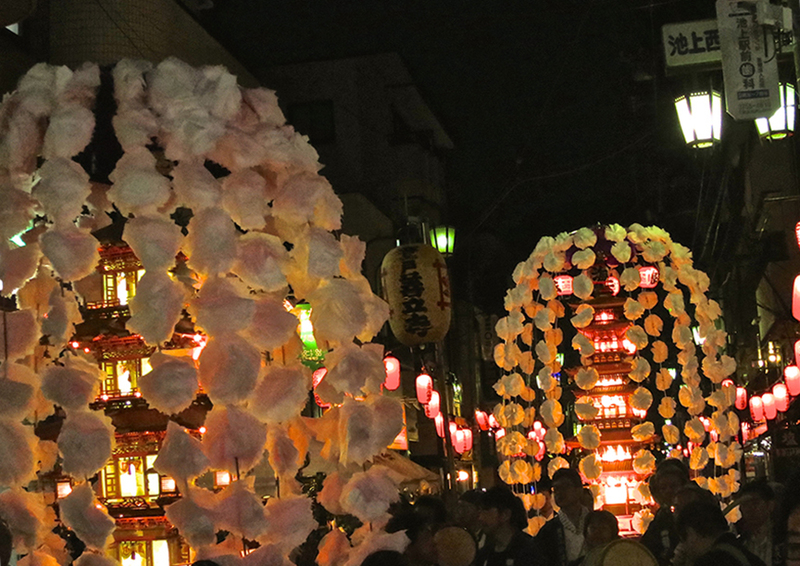 Even the streets were lined with pink lanterns as far as the eye could see. 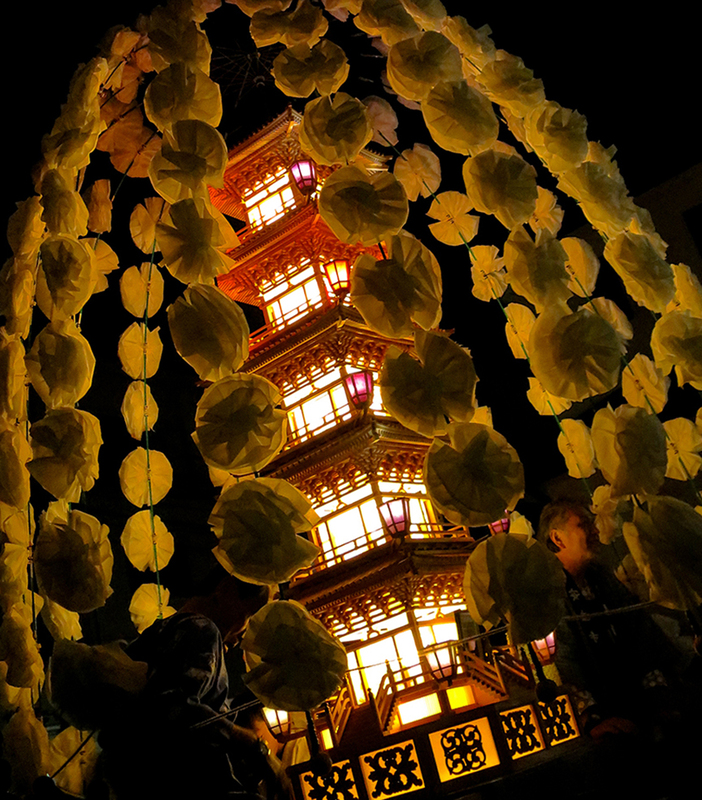 Not surprisingly, a festival of 10,000 lanterns also attracts thousands and thousands of people. This is the view from the stairs you climb to get to the temple. At the base of the stairs, we suddenly encountered a frighteningly large police presence in a glaring pool of light. The Japanese friend I was with said that crowds of people eating and drinking and making merry can turn ugly fast, and the police buses parked in an adjacent shadowy street were there to cart away arrestees if things went south. But my friend who blogs as Tokyobling said that actually those are the buses that transport police to the festival from all over the Kanto region to help out (see his comment below). He says the bright lights are necessary to keep accidents from happening at the foot of the stairs. That makes sense to me, because people slow down to start climbing, but the crush of festival-goers keeps pushing from behind. 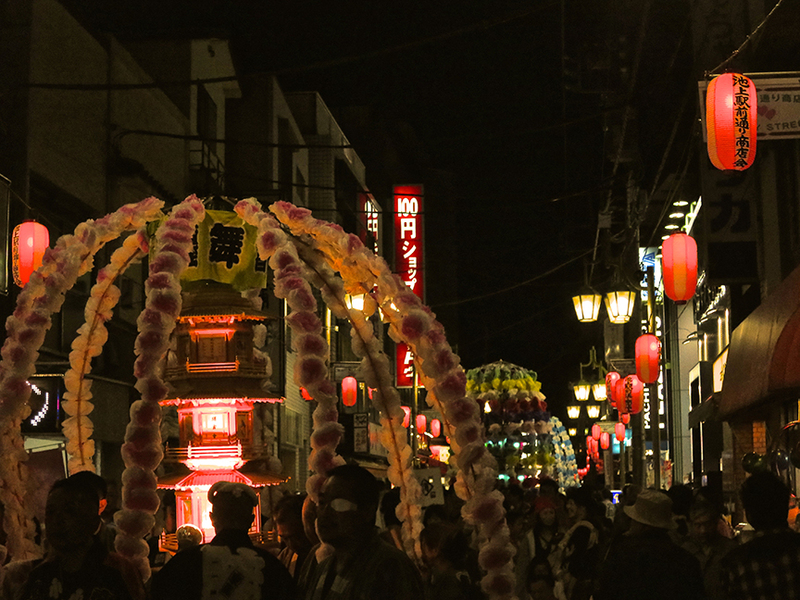 Special thanks go to Tokyobling’s Blog, where I learned about this fantastic festival. I suggest taking a look at his posts, because he takes gorgeous pictures and explains what’s going on better than I can. 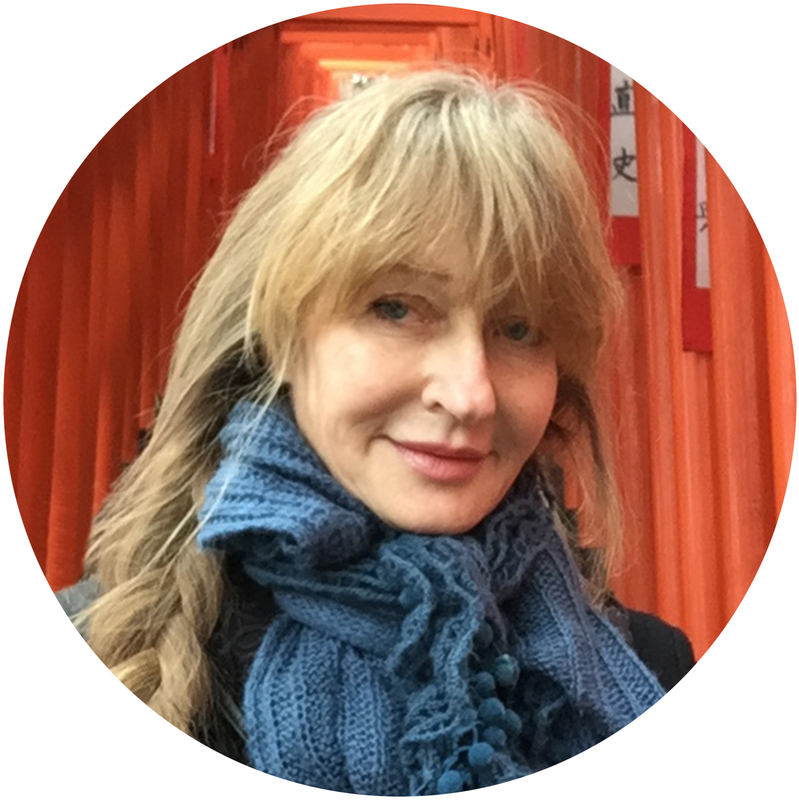 If you’re in Tokyo in October and would like to go to the Oeshiki Ikegami festival, a map is on my website, The Tokyo Guide I Wish I’d Had. Sorry I missed that one! Where is Ikegami? In all these years I’ve never heard of that festival. I’ve meant to go to this festival for a few years, but I had no idea it was so huge! It might be the biggest festival I’ve ever been to. 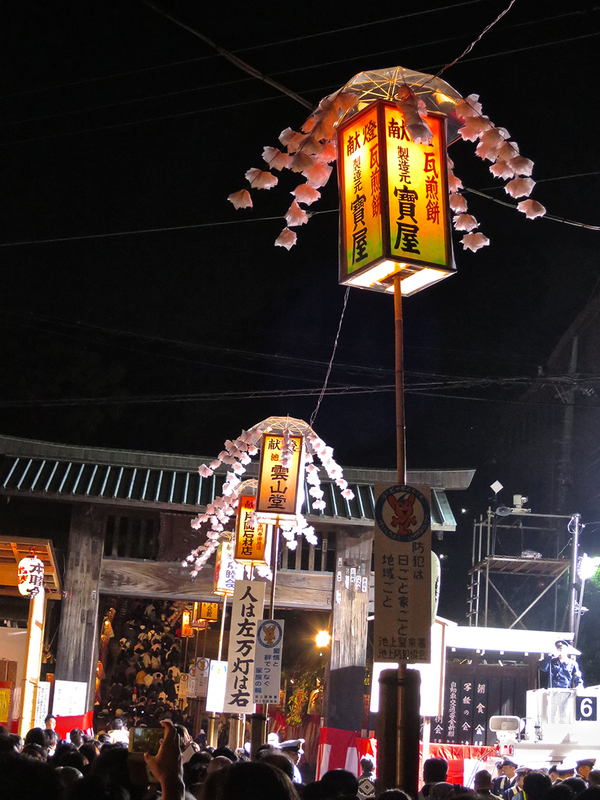 Ikegami Honmon-ji is right between Ikegami and Nishi-magome stations. 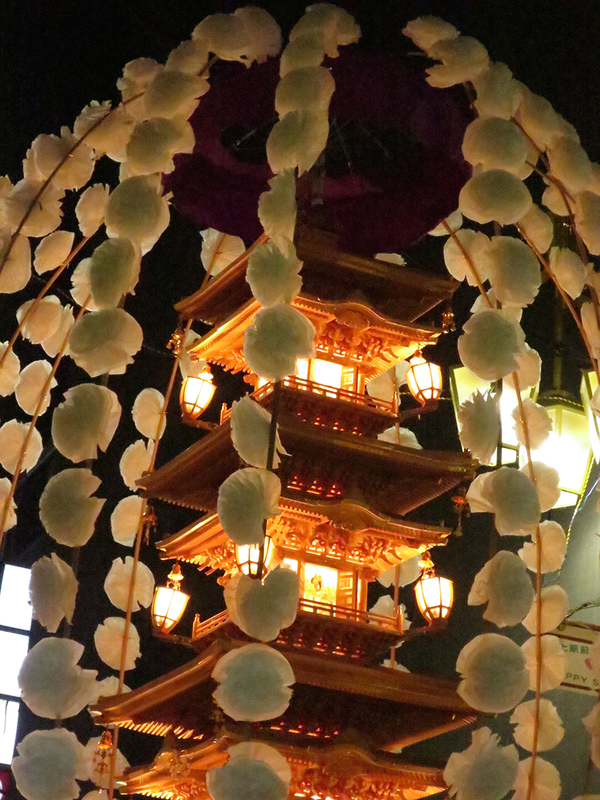 It’s the temple where Nichiren died, so this Oeshiki festival is supposed to be the most spectacular in Japan. 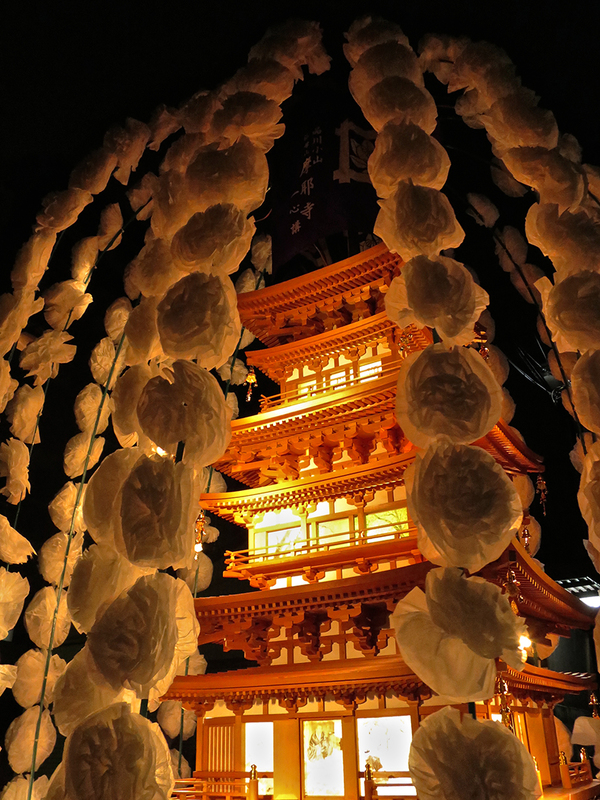 I’d never been to this temple before, but I’m planning to go back in the daytime because it looks spectacular. I put up directions and a map on my website (http://jonellepatrick.com/directions-to-all-destinations/ikegami/), but you can probably find it faster on your phone by searching Ikegami.